The artists in this exhibition use elements taken from theatre and circus as a device to challenge and trick the viewer. Artifice, as concept or medium, is the underlying thread in this group of works that takes us into a darker world of suspense and magic. 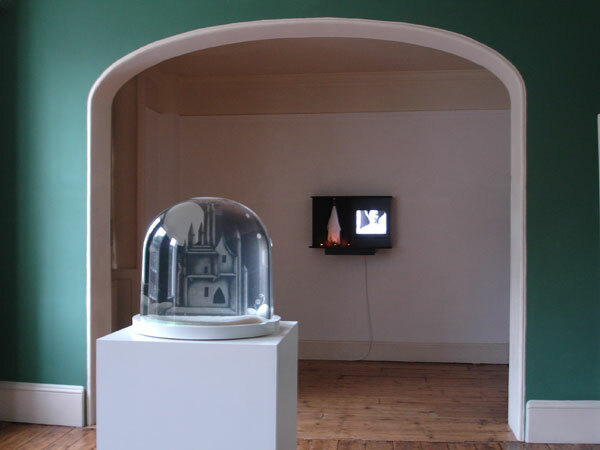 North Face / South Face is a pair of photo engravings made by Marion Coutts while on the Kettle's Yard Fellowship in Cambridge. They derive from images of the Combination Room at St John's College, Cambridge where the artist was in residence. 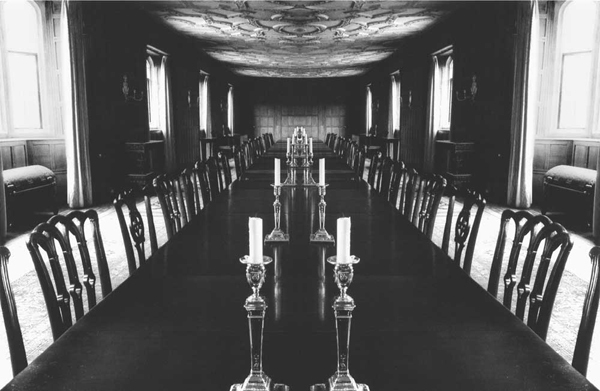 The historic setting for formal meals, the room has a 20 metre long table and elaborate stucco ceiling. 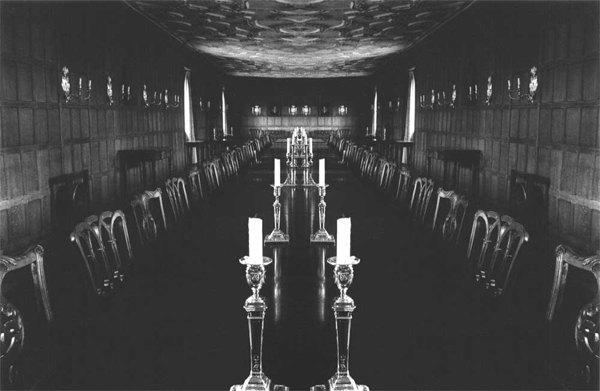 The images, shot in sharp perspective, draw on the staged formality of the long hall, with its symmetrical chairs and candlesticks and use vertical mirroring to create two entirely new and ambiguous rooms, one bathed in light, the other shrouded in darkness. 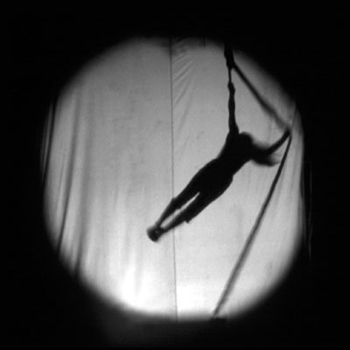 Sophie Lascelles presents a new 16 mm film, Akemi, which is the first of a series of collaborative films with actress and circus artist, Akemi Yamauchi. 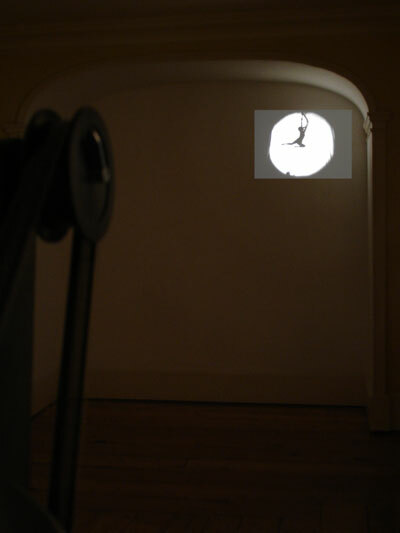 In this projection, a circus artist appears as a shadowed figure spinning gracefully in an intense circle of light - a spot light. Drawing from the early tradition of magic lanterns and optical toys, this work explores shadows, the flickering of our thoughts and our own relationship with films. 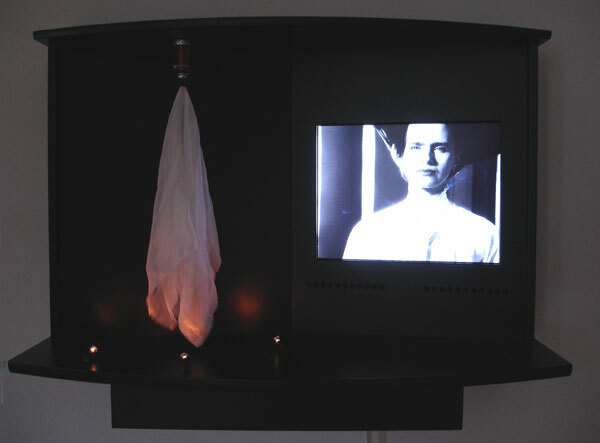 Paulette Phillips presents an integrated sculpture exploring invisible or imagined phenomena; telepathy, hypnosis, attraction and electromagnetism. 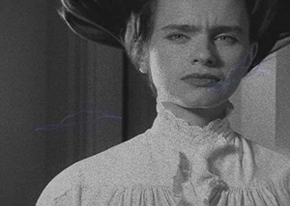 Homewrecker#1 is a one-minute film loop, in which a woman enacts a forceful gaze. 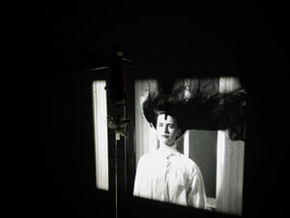 A 16mm black and white film sequence is shot in such a manner that the space around the woman appears to contract and expand - alluding to the electrically charged environment. Homewrecker#2 is a ghost-like levitation produced through an electro magnetic sculpture. Paulette Phillips is interested in the history of electricity and the flow of currents and how it is related to human behaviour and the phenomena of human attraction. Sarah Woodfine’s depicts imaginary worlds which are reminiscent of fairytales and dreamlike spaces, existing just outside reach in a two dimensional world. 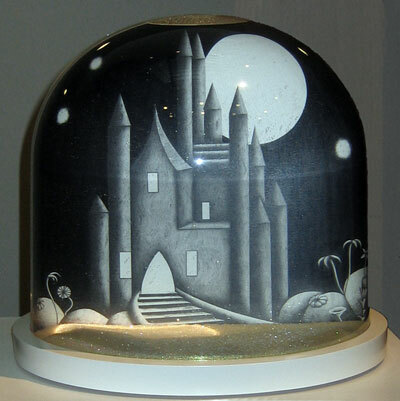 Her pencil drawings can be presented as three dimensional cut-outs in a perspex box, or they can be encased as the central image inside a snow dome. In both instances the image changes at every angle making moving around the object part of the seeing. Castle, tepee, hybrid plants and flowers are staged on a platform to create a fantasy world that appears and disappears unnervingly.